Moving in unity, three strands are stronger than one could ever be alone. These love knot earrings take three strands of pure 14K gold and weave them in seamless harmony to form a design with no beginning or end. Based on a centuries-old Celtic knot, the love knot is a fitting picture of being woven together with another person for a lifetime, and many have adopted this motif as an emblem of eternity. The loops that form these earrings can never be pulled apart or separated, and together they form a pair that's rich in both symbolism and timeless good taste. Earrings measure 11.5mm and have standard push back posts. Earrings weigh approx. 2.6 grams. 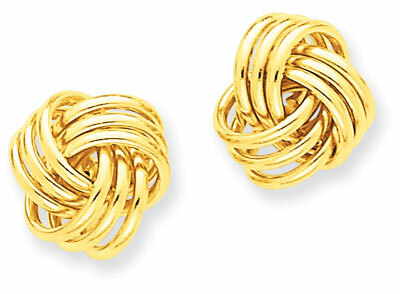 We guarantee our Basketweave Knot Earrings, 14K Yellow Gold to be high quality, authentic jewelry, as described above.